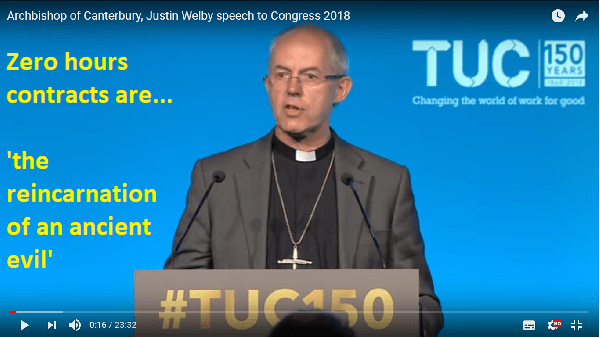 Trump’s visit to the United Kingdom – ‘Distraction Politics’ of the very highest order? The British Press have been all over Donald Trump’s four day visit to the United Kingdom… but predictably the focus has been mostly on the trivial details of the itinerary, the ‘intense’ security surrounding the event and Trump’s ‘outrageous’ off-the-cuff comments about Brexit, rather than on the substance of Trump’s pro hard-Brexit arguments or on the logic behind why thousands of people are protesting about his being here. The BBC News coverage, for example, made a great deal out of the stringent security methods surrounding Trump’s first visit, and there was lots of coverage of Trump ‘in transit’ to various elegant places, such as Blenheim Palace, where we were reminded that while this wasn’t a state visit Trump still gets the Grenadier Guards playing the national anthem, a full-on Banquet, and he gets to meet the Queen. There was, of course, coverage of the protestors outside Blenheim palace, where a couple of them told us that they didn’t like the politics he represented, or his misogynistic and racist attitudes, but this was largely stripped of any deeper logic or substance. There was also lots of commentary on the (non)-content of the interview Trump gave to The Sun Newspaper on Thursday 12 July during which he criticised Theresa May for not listening to his advice on Brexit and pursuing a ‘soft-brexit’, suggesting that this would now mean that a ‘trade-deal’ with the USA would be very unlikely, and even lamenting the fact that Boris Johnson had stepped down from Politics, stating that he would make a great ‘Prime Minister’. According to Chomsky, the function of such ‘outrageous comments’ is to keep ‘all eyes on Trump’ and to distract us from the wider neoliberal republican (and Tory) agenda which seeks to dismantle government protections for the average working person, and make it easier for elites to destroy people and planet for short term profit. Chomsky makes some pretty ‘hardline claims’ in this video, mainly that in reality Trump is part of a broader republican administration who knows exactly what they are doing: they have an extremely neo-liberal agenda to dismantle every part of government which protects the poor and the planet. In America the Republic Government is currently doing this, by taking away workers rights, pollution laws, consumer protections and by basically destroying the planet for short term profit. Back to the media coverage of Trump – the subtle art of distraction away from the harsh realities of neoliberal politics? Here I just want to focus on how the BBC coverage distracts us, both in the US and the UK…don’t forget that any 10 minute news item could focus on any aspect of the issue…. Firstly, at least 20% of the coverage is on triviality – itineraries, security, personalities, which has nothing to do with politics. Time wasted here. 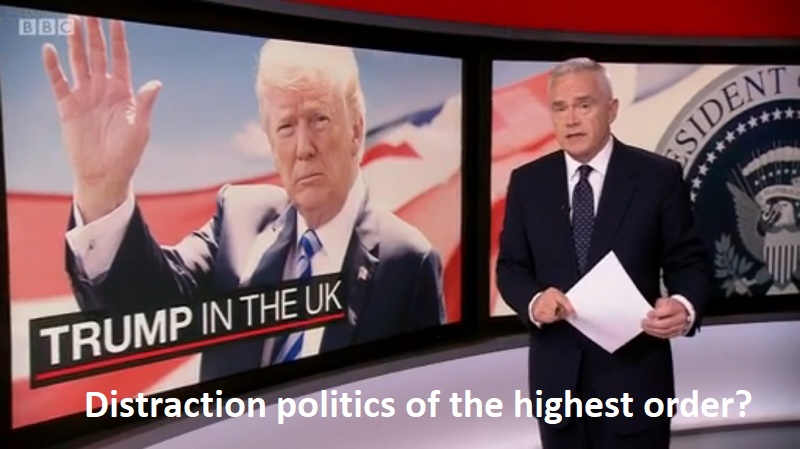 Secondly, Trump’s comments in The Sun give us a distorted idea of how politics work – he personalises politics – giving us the impression that Theresa May is ‘free’ to heed his advice or not, that’s not how politics works, individuals are generally much more constrained. Thirdly, Trump greatly simplifies the issues…. As he’s got the power to decide whether or not the USA does a trade deal with the UK… it’s the republican party more generally that decides that, remember he’s embedded in a power elite, he’s not a ‘lone operator’…. However, in the media, he appears like a lone operator, that’s why the elite love him so much, it’s just total obfuscation. Fourthly…. Trump today (Friday, one day after) actually called his interview with The Sun ‘Fake News’ and denied criticizing Theresa May, even though the whole thing is recorded: another great distraction tactic, keeping the media focused on him, again away from the issues. Fifthly… some protesters are protesting because they are against precisely the reality that Chomsky points out…. They are against people destroying the planet for the short term gain of an extremely wealthy ultra-minority. Yet does the media tell us this: no – most people are there protesting because they don’t like Donald Trump the man, the misogynist, again personalising and individualising the issues which are fundamentally social. I’ll leave it there for today, just a few comments to illustrate what Chomskian analysis of the mainstream media coverage of Trump’s visit to the UK might look like! All pictures screen captured from BBC News at 10.00, Thursday 12th July. This post has also been published to the steem blockchain, check out steemit for more details! Education has long been influenced by private companies, but the rise of digital education has expanded the role of private technology companies, in public education enormously. Such companies range from the big global technology companies such as Microsoft and Facebook to smaller, silicon valley tech startups. This post explores the companies involved, and the neoliberal, Silicon Valley mindset that lies behind what I call the ‘digital privatization of public education’. Schooling in the 1700s and 1800s was provided largely through private institutions, and the expansion of public education in the late 19th and 20th centuries was influenced by the commercial interests of text book publishing companies. Digital Technology gives private, commercial interests greater potential to influence how public education is organised and delivered. The reason for this is simply logistical – Nation States do not have the scope to develop digital technologies, and so it is massive, Transnational private technology companies such as Facebook, Google, Apple and Microsoft which are driving the development of these technologies, and the public education sectors of national governments who are their largest potential market. All of the above mentioned companies have education divisions, oriented to developing education software and applications for use in schools, and many other companies are developing educational products: from Pearsons to Lego. At the other end of the scale from the massive TNC sector there are hundreds, if not thousands of smaller educational technology start ups, as small-fish seek to gain a foothold in the education market. The fact that digital education is very big business is due to the fact that the global market for education is estimated to be around $5 trillion, with the estimated market for online Higher Education ‘e-learning’ products alone estimated at $91 billion. In short, the potential expansion of for-profit digital education is huge. TNCs enjoy economies of scale that dwarf public sector organisations – they have global reach, and enormous sums of money to invest, and they tend to ‘think big’… as one of Google’s international heads of education puts it: ‘Technology was hard to deploy in schools and we’re making the solutions we supply very easy to manage….new technology is finally able to work for us in schools’. The private sector emphasize the importance of quick results and demonstrable outcomes – they are, after all, ultimately accountable to their share holders. The IT industry is clearly well poised to bring innovation into education – innovation being defined as introducing new products and ideas that support changes in the established way of doing things. These organisations thrive on thinking big and acting quickly. They pride themselves on thinking differently – they see themselves as risk takers and boundary-pushers, cultivating an ‘outsider perspective’ unfettered by establishment thinking or old money. This is especially true in the ed-tech start-up sector, in which millions of dollars are invested in hundreds of companies, only a few of which will go on to be the next ‘big thing’. Sebastian Thrun (co-founder of online learning company Udacity Inc reasoned ‘Education is broken. Face it…. it is so broken at so many ends, it requires an little bit of Silicon Valley Magic’. The idea of ‘Silicon Valley Magic’ alludes to the set of business practices and approaches that underpin the new high-tech economy and its increased interest in education. This mentality was described neatly by Will Hutton, based on his account of a visit to Palo Alto during the early 2010s following which he wrote of the global significance of the strain of ‘Californian Capitalism’ that characterizes Silicon Valley institutions such as Google, Oracle and even Stanford University. ‘We are increasingly living in a world where economics, politics, culture and society are being shaped by West Coast ideals of the power of computing, entrepreneurialism and risk-taking approach to investment. The ways Silicon Valley firms seek to do business are shaped profoundly by the programming and hacking backgrounds of their main protagonists such as Mark Zuckerberg, Larry Page, Sergcy Brin, Larry Ellision, Peter Thiel and so on. All of these high-tech billionnaires remain steeped in a programmer mindset where a faith in computational power and an always on networked way of life fuel a relentless focus on invention and innovation. This is a culture of all night coding sessions and a succession of ambitiouss start-ups, most of which quickly fail, backed by investors keen to take a punt on the next ‘big thing’. These are ventures which are based on big ideas, solving computational problems, entrepreneurialism, openness, collaboration, learning through failure and relentless self belief and optimism, based on a relentless mindset that revels in the power of individuals rather than institutions, and the creative potential of manageable amounts of renewal and disruption. Although all of these high tech firms seek to make a profit, many of the main industry protagonists also want to ‘make a difference’ and seek to use frontier technologies to engage with immense societal challenges such as world health and global poverty, and it understands that it is part of society and owes a debt to the culture and public infrastructure that created it. In the well-established and vast educational programmes run by all of the large multinational IT companies – often under the aegis of ‘corporate social responsibility’. These activities range from the physical design and construction of ‘schools of the future’ to the development of teacher training programmes, alternative curricula and the provision of computer hardware, software and the infrastructure to educational institutions. There are also a range of far more ambitious initiatives such as Peter Thiel’s ‘Thiel Fellowship’ through which young people are awarded $100 00 to drop out of college and pursue their dreams by setting up a world changing business idea’; Mark Zukerberg’s ‘Start-up: Education’ through which Zuckerberg has made personal donations of $100 million to the Newark school district and $120 million to schools in the Sanfrancisco Bay area; the Bill and Melinda Gates Foundation boasts an extensive educational programme, including its key role in driving recent US school reforms around standardised testing and the common core curriculum. It has also spent over $470 million on US higher education reform, funding projects and generally creating what the Chronicle of Higher Education calls an ‘echo chamber of like minded ideas’. We should also not overlook the considerable ‘soft power’ of high tech corporations in education decision making, such as with the computer industry’s considerable lobbying governments to focus more on teaching coding in schools, which now seems to be accepted universally as a ‘good thing’. The Chairman of Google, Eric Smidt has been a leading proponent of this push since 2010. Finally, there are the various companies involved in setting up MOOCs, one of the largest of which is Coursera, bolstered by $85 million of venture capital funding. All of these activities shows that corporate involvement in education is sometimes submerged in complex networks of influence and power, and if one finds time to follow the money, one finds that high-tech firms are in some way involved in seeking to profit from most, if not all, of the digital education initiatives out there. It follows that the biggest movers and shakers in digital education are not educators and teachers, but rather programmers, hackers and the trillion dollar tech industry which has grown up around them. These interventions illustrate the power which IT corporations can wield over public education, and these are increasingly strong voices in conversations about education reform, setting the tone for how education should be reimagined in the ‘digital age’. Sources: Nick Selwyn (2016): Is Digital Education Good for Education?